It’s Eliza’s show; My Fair Lady for the 21st century opens at Lincoln Center’s Vivian Beaumont Theatre, 62 years after its world premiere. 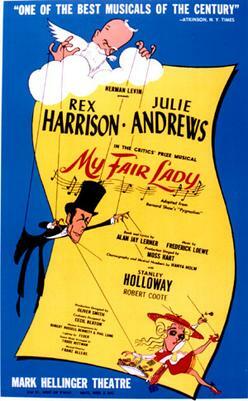 The original Broadway poster for “My Fair Lady” by Al Hirschfeld. Since Alan Jay Lerner and Frederick Loewe’s My Fair Lady is widely regarded as one of the enduring masterpieces of American musical theatre, and one of the all-time favorite modern ‘operettas’ in the Austrian-German repertoire system, many revival is challenged to meet the high standards of its well-known predecessors, yet satisfy the imagination of today’s audiences. Director Bartlett Sher, abetted by a capable cast and design team, has delivered an enjoyable, revisionist interpretation, which nods to today’s #MeToo debate between the sexes. With subtle cuts and directorial choices, this My Fair Lady shifts the power from Henry Higgins to Eliza Doolittle as its triumphant protagonist. Let’s just call it the Eliza show! It is Higgins who remains a prisoner to his social class, hostage to his own misogyny, trapped in his loneliness, secure only in his tidy, academic world of phonetics. It is Eliza who finds escape from her social class, her life as a flower seller in Higgins’ wager that he can transform a crushed cabbage leaf into a duchess, only to discover that her new-found freedom is infinitely more complicated than she ever expected. Much as George Bernard Shaw, Alan Jay Lerner, Frederick Loewe and Moss Hart up in heaven might delight in this enduring power of My Fair Lady, this revisal is alternately thrilling, occasionally misguided, lovely to see and hear, yet riddled with missed opportunities. The first clue that this is no ordinary My Fair Lady comes not from the reassuring, opening notes of the famous overture as conducted by Ted Sperling and a 29-piece orchestra. Emerging alone on the enormous empty thrust stage, the first figure we see is Eliza Doolittle with her basket of violets, as gradually the denizens of Covent Garden appear around her. 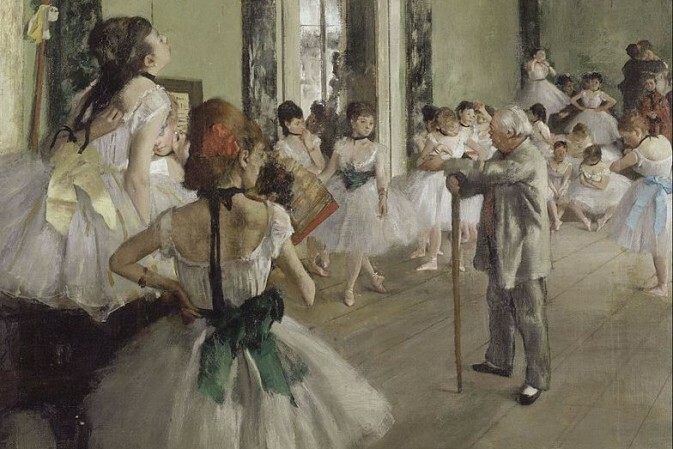 It is a classic melting pot of social classes, from the working folk of Covent Garden market to the formally-attired aristocrats leaving the opera in search of a taxi. 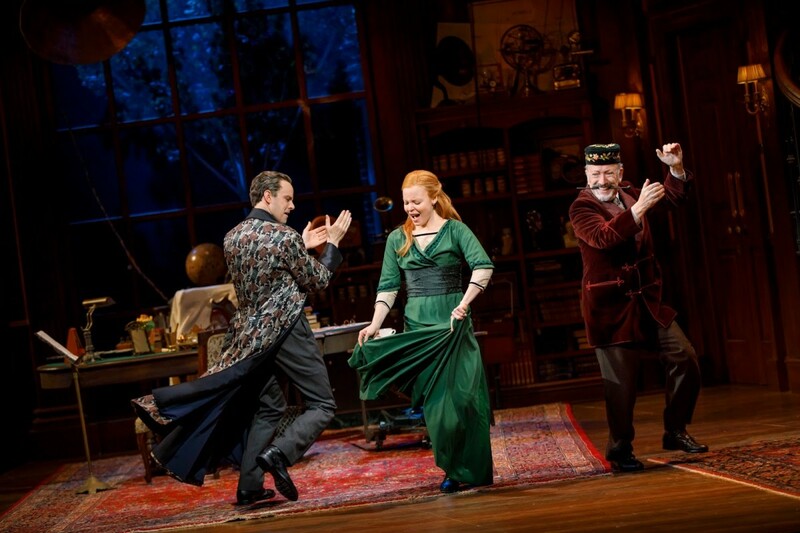 Lauren Ambrose makes the role of Eliza Doolittle very much her own, in her acting choices, line readings, vocal inflections, her reddish hair, and her at times unflattering wigs and costumes. Her light soprano voice is honest and charming in “Wouldn’t It Be Loverly?,” yet seldom unique or truly memorable. Her performance is pragmatic and adventurous, never radical, yet she always commands audience attention and focus. 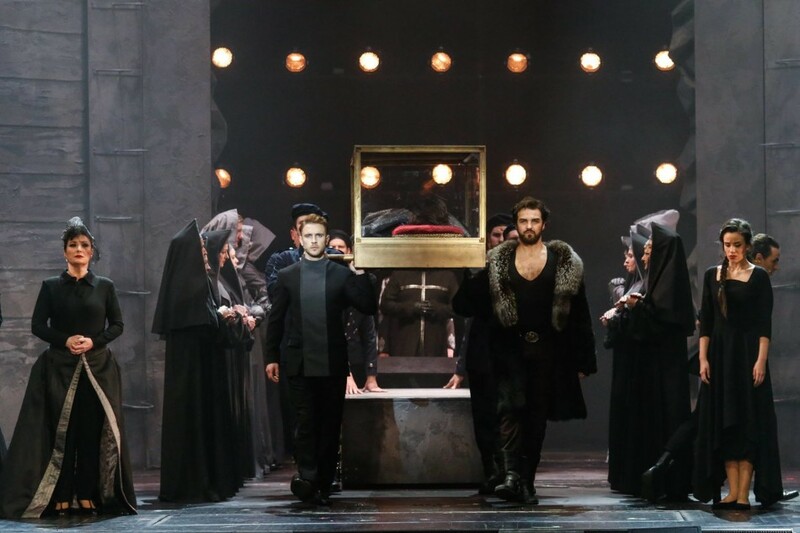 Harry Hadden-Paton is a younger, more appealing Henry Higgins than is customary, and in a welcome twist he sings the score far better than most men cast in the role. His rendition of “I’ve Grown Accustomed to her Face” is genuinely touching and cathartic. But if director Bart Sher and Harry Hadden-Paton have subdued Higgins’ monstrous qualities, they have consequently diminished Higgins as an adversary, reducing the stakes of battle to barbed quips. 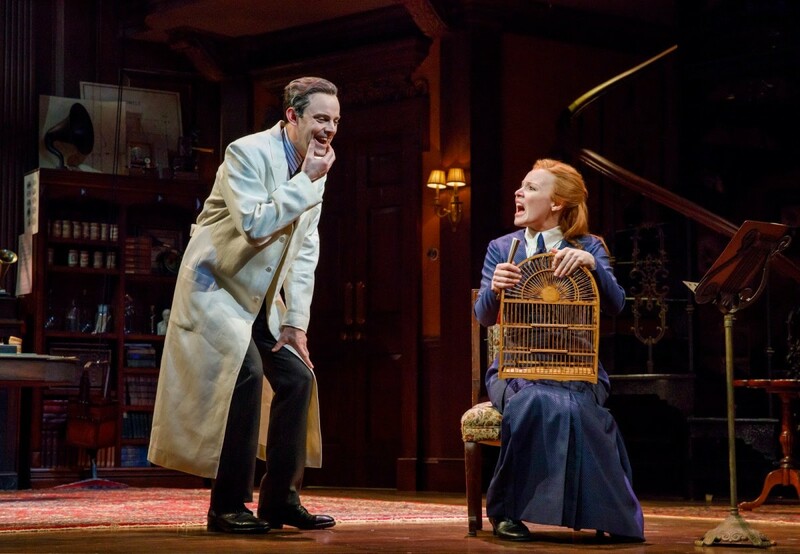 Consequently this production’s My Fair Lady makes Eliza’s triumph inevitable; shorn of narrative suspense, the unbalanced evening becomes a series of handsome set pieces, witty banter and welcome classic musical numbers. The evening’s undoubted high point belongs not to Eliza, Higgins and Pickering’s “The Rain in Spain,” (Ambrose, Hadden-Paton, and a dull Allan Corduner), but to Norbert Leo Butz as Alfred P Doolittle, Eliza’s father, when he leads a rowdy pub chorus in a thrilling rendition of “Get Me to the Church on Time.” Even if Butz lacks any British accent whatsoever (in a play where dialect and accent are decisive), his fearless solo dance on a table top celebrating his last night as a bachelor is priceless, carried away on his back as if a corpse at a funeral. But director Bart Sher and choreographer Chris Gattelli have added several male ensemble members in drag as can-can dancers which prove a jarring sight. Yet, Butz’s scene in which he first confronts Higgins over Eliza is sensationally funny. Diana Rigg is fine as Higgins’ mother, yet with cuts to the book her bonding with Eliza is scarcely credible. Among Sher and Gattelli’s other dubious staging ‘improvements,’ Higgins’ servants sit on the sofa during Eliza’s “I Could Have Danced All Night,” and Freddy Eynsford-Hill (well sung by Jordan Donica) is oddly tasked with carrying Eliza’s bags once she leaves Higgins’ home on Wimpole Street, and all through Covent Garden. When Eliza sings “Just You Wait,” Higgins’ entire Wimpole Street home spins on the turntable so fast that Eliza must run from room to room just to keep up, much less be seen or heard. The handsomely costumed Ascot Race scene is staged imaginatively not in the traditional black and white, but in shades of lavender. How to account for Eliza’s penultimate exclamation “C’mon Dover, move your bloomin’ arse!” which falls flat in the rush to change scene. Along with excisions to Lerner’s famously long libretto, some creative choices feel ill-advised, rushed, or register as opportunities missed. Much press attention has been focused upon this production’s penultimate line (Higgins: ‘Where the devil are my slippers?’) in which Eliza returns to Higgins’ study. At the symposium on the Monday night following the opening, Lincoln Center Theatre’s artistic director Andre Bishop spoke at length about such experimental changes made during previews. If the intent of original authors’ Lerner, Loewe and director Moss Hart was ambiguous to the point of brilliance in 1956, this director Bart Sher oddly has Eliza touch Higgins’ face tenderly. In the late Edwardian era in which My Fair Lady is set, this is implausible, an awkward, even strange gesture. Forgiveness? A declaration of love or peace? A sexual pass? She exits downstage into the audience. I’d prefer to think that while Eliza has returned, Eliza’s and Higgins’ battle has just begun, but on altogether different terms than before. But My Fair Lady typically survives directorial interpretation, ineptitude or mis-casting, lest viewers obsess over the indelible 1956 original. Be it a re-creation of the original Moss Hart/Hanya Holm version, or a two-piano version staged by Gary Griffin in 2004, or a concert staging with the New York Philharmonic in 2007, or in German at Komische Oper Berlin in which Andreas Homoki’s staging unfolds from a giant gramophone, My Fair Lady always triumphs. So let us celebrate Eliza’s return in this My Fair Lady, with its sparkling original Robert Russell Bennett / Phil Lang orchestrations, its handsome production designed by Michael Yeargan (sets) and Catherine Zuber (costumes), imperfect though this Fair Lady may be.